OTC Low Clearance Truck Clutch and Flywheel Handler opens stance for ease of access to the work. Its unique linkage design raises the load from horizontal to vertical as the pump is cycled. This eliminates any lifting of the clutch by the operator. 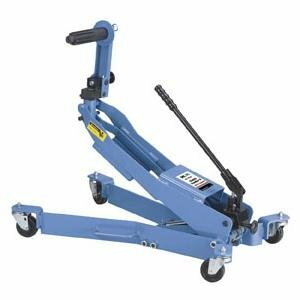 It handles 14 inch and 15-1/2 inch clutch assemblies weighing up to 250 pounds Swivel casters provide easy maneuverability. It includes a 2 inch splined shaft with a 1-1/4 inch pilot to aid in alignment.